A woman in the US who said she had found part of a human finger in a bowl of chilli last month has been arrested and charged over the incident. Anna Ayala, 39, was arrested on Thursday night at her home in Las Vegas, Nevada. A Clark County police spokeswoman said Ms Ayala had been arrested as a fugitive and charged with larceny. 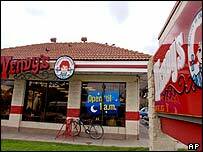 Ms Ayala said she had found the finger while eating at a Wendy's restaurant in San Jose, California. Wendy's, the number three US hamburger chain, said it carried out an investigation into the incident and found that the finger did not originate in its food preparations. The company said its sales dropped significantly in the San Jose area following Ms Ayala's claims, and it has offered a $100,000 reward for information in finding who the finger belonged to. Ms Ayala has repeatedly said that she did not plant the finger in the food.